FORT COLLINS — WoodSpring Suites is proposing to build a new extended-stay hotel on a vacant parcel just east of U.S. Interstate 25 and south of Mulberry Street in Fort Collins. 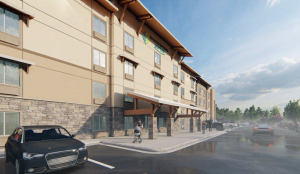 WoodSpring Suites has proposed a new 123-room extended stay hotel in Fort Collins. Courtesy Fort Collins city planning documents. Preliminary development plans, which are set to be reviewed by city planning staff, call for the construction of a roughly 48,000-square-foot, 123-room, four-floor hotel to be built at 847 E. Frontage Road. Founded in 2003 as Value Place, WoodSpring Suites operates more than 250 hotels across the country, including locations right off I-25 in Loveland and Firestone. WoodSpring was bought last year by Maryland-based hospitality giant Choice Hotels International Inc. (NYSE: CHH) for more than $230 million.